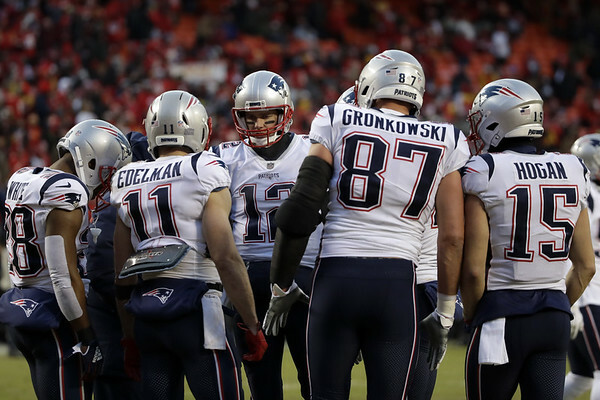 As surprising as it may seem, or maybe it isn’t, the Patriots have only gotten better on the offensive side of the ball as the season has gone along. This has particularly been the case in the playoffs. After averaging just 27.2 points per game over its first 16 games, New England has averaged 39 in the postseason. Yes, the team’s yards per play is down from 6.8 to 5.9, but that has more to do with the emergence of Sony Michel and the run game than anything else. With the Rams owing the No. 2 scoring offense in the NFL this season, the Patriots are going to have to put up some points themselves and that means Tom Brady is going to have to do his usual Tom Brady thing and find the open receiver, which as he as shown in one of the best at doing. Los Angeles is not only going to have to account for Julian Edelman, Brady’s favorite target, who is second all-time in postseason receptions with 105 and fourth with 1,271 yards to go along with five touchdowns in 17 games. Then there is, of course, tight end Rob Gronkowski, receiver Chris Hogan and tailback James White. Over the course of the regular season, New England had five different players - Gronkowski, Edelman, White, Hogan and Josh Gordon - with at least 35 catches, 530 yards and three touchdowns and had another two - Phillip Dorsett and Cordarrelle Patterson that each had another 247 yards and three scores. Brady has no shortage of weapons to rely on and head coach Bill Belichick and offensive coordinator Josh McDaniels have shown an uncanny ability to put their playmakers in the best positions to be successful. It will just be a matter of how the offensive line, which has played well as of late does against the Rams’ two key defensive players in linemen Aaron Donald and Ndamukong Suh. Yes, the Patriots have Tom Brady playing quarterback. Yes, the NFL is have evolved more into a passing leave over the last handful of seasons. But New England has found plenty of success late in the regular season and in the playoffs running the football and it’s forced teams to play from behind early. Against the Chargers in the AFC Divisional Round, the Patriots engineered a 14-play, 83-yard drive, which spanned seven minutes and 11 seconds. Against the Chiefs in the AFC Championship game, New England used a 15-play, 50-yard drive that ate up the first six minutes and 55 seconds. And Sony Michel is more than up for the challenge. In those two playoff games, he’s rushed for 242 yards and five scores. Although a lot of the talk will be about both the Patriots’ and the Rams’ offenses, New England’s defense has been playing some of its best football as of late. The unit held the Chargers to seven points in the first half in the divisional round and then held the vaulted Chiefs’ offense to zero first-half points in the AFC title game. Los Angeles has plenty of playmakers at its disposal. Jared Goff completed 64.9 percent of his passes for 4,688 yards, 32 touchdowns and 12 interceptions during the regular season, while both Robert Woods and former Patriot Brandin Cooks caught more than 80 passes for 1,200 yards and five touchdowns. Too Gurley ran for 1,251 yards and 17 scores in the regular season. But the Patriots, as always, should be ready. Posted in Newington Town Crier, General Sports on Friday, 1 February 2019 22:07. Updated: Friday, 1 February 2019 22:10.